Log into your protel hotel software. The user you are using to log in must have protel Air administrator rights, i.e., they must have been assigned the pAir Kundenadminrolle (pAir Customer Admin role). If you are using protel Air for several hotels, select the hotel in the upper right part of the window for which you would like to create the HTML5 user. Note: Only the hotels that your user has access to will be displayed here. In doing so, you will navigate to an input mask to manage the new user. In the left column of the dialog box, all of the users for the selected hotel will be displayed. A window then appears for you to enter the user data. The active check mark is automatically set. Remove this check if you want to permit a user at a later time. Enter the Last name, First name, and Initials and select a language for the user. In the next field, you will need to enter the email address for the new user (please do not use any group addresses such as reception@myhotel.net). The email address must be valid and cannot be used more than once. Only one email address can be used for each user to insure the correct transmission of new passwords to the respective user, should they have forgotten it. If the email address is already being used, you will not be able to add the user and the field will be highlighted in red. Level: The Customer level is automatically allotted to the default protel Air user. The level determines which roles are available. Hotels: Select the hotel to which the user is to have access to by clicking on the selection button . If your hotel is part of a hotel chain, you can make it possible for the user to have access to numerous hotels. The following window will then appear. Figure: System > User administration > User > Create new user. By means of the [Enable recursive] button, select all the hotels from a hotel group. If a new hotel is added to the group, the user can also automatically access this hotel. This would not be the case if the [Enable recursive] button is used instead to select the individual hotels. In order to permit only single hotels, select one or more hotels and click the [Save] key. Def. Hotel: The user's default hotel (the hotel which opens when starting protel Air) can only be changed after the user has been created (see further down). 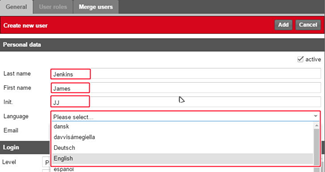 User name: In the last field, enter another User name The user name is the name used by the user in the login mask. Once you have filled out all of the fields, click on the [Add] button located in the red banner. Saving a new user takes a few seconds. Please do not click any additional elements until the window has updated itself. If the user is not shown even after a few second, reload protel Air in your browser (ctrl + 5) and reopen the user administration. The default hotel is the hotel to which the user is automatically logged into (only relevant for more than one hotel). After you have entered all of the necessary data, an email will be sent to the employee's email address. The email contains the login link for protel Air and the login data (username and password). After the first login, the user will be required to enter a new password. The password must contain at least seven characters and must consist of numbers and letters. HINT: Create exclusive user roles! For each HTML5 user a corresponding Flash user is automatically created. The Flash user is required to grant or deny your users access to certain system data areas. Determine which part of the Flash system data the user is allowed to access.